You know I'm boring. My New Year's Eve proves it. Today, Angie and I did go over to Canton to shop at the Fiesta Ware Dish Barn and get some MDF shapes I needed at First Monday. We had lunch at Buttermilk's, but that's as exciting as it got. We didn't even tarry long. We got what I was looking for and were done. We got home by, I don't know, maybe 5:00, and then I ran by my parents' house and went home for the night. 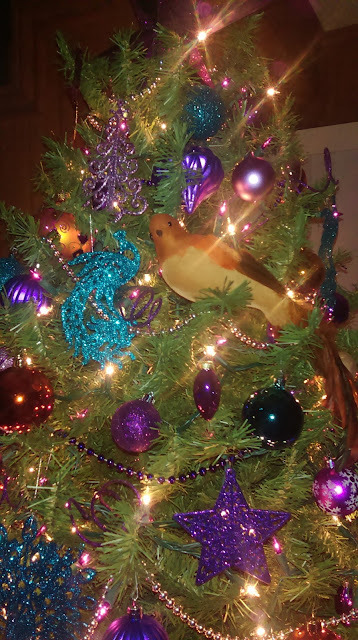 I took ornaments off of the tree (I didn't pack them up though - just got them onto the kitchen table), read, dozed before midnight, woke back up, and that was it. I did pick up this for our booth as an attention getter. I wanted to have it for Derrick Days in April, but it will go out to Virgil and Maudie's first. It will be painted silver with the oil at the top black. This is the photo of the excitement of the week. While I was out at Virgil and Maudie's boxing up Christmas product, a transformer blew out. One of the shop owners and I walked outside to see what was going on and saw the start of a grass fire. Evidently someone was driving along with something in the back of their truck or trailer that blew out, hit a power line, and sparked a grass fire across the highway from the shop. When Emily called 911, they said they would send someone to "check it out." The wind was blowing at high speeds, and it seemed like it took them forever to get out there. Are you familiar with Klout? It's a social media measuring tool/website that gives you a score based on your influence, what you talk about on social media, etc. Sometimes it comes up with the strangest things. I am ranked as an "expert" on The Bachelor already. Talking about it and the hot tubs on the show has evidently made me an expert on all things hot tubs and saunas. That's the only connection I can make. Otherwise, Klout is kind of confused. I can't figure what I have said that makes me rank as an expert on romance or the Roman Catholic Church. I'm definitely not an expert on BEING a mom. The Sunday before Christmas it didn't get out of the 30s. A week later, on Christmas it was in the upper 70s. It was close to 80 part of the week. (It was 78* in my office day before yesterday because I didn't turn the air up there on.) I've gone back and forth between air and heat this week. Dad tarped all my plants before the cold weather hit the week before Christmas, and they still froze or they look like they froze. When we pulled the tarps off after a week, they looked horrible. Some of them had mildewed. Fuzzy mold hung off of hibiscus blooms that died before they bloomed. I'd kept that hibiscus alive longer than I usually do. Thankfully a few of my pineapple plants were in the small metal shed and didn't look as bad. If all my pineapple plants die, I'm going to be so upset. I had a great looking crop going. I picked off all my lemons last week. Now all the leaves are shriveled up, but at least the steps are still green. It's going to get cold again next week, so dad was able to fit more into the shed, is going to use plastic instead of the other tarps this time, and brought my big palm inside. I've had it for years and years. It's frozen before. It keeps blowing over because it's top heavy and heavy to one side. Before my sunroom was an art studio, I brought all my plants in. It's a catch 22. I wish I could bring them in now, but there's just not room. It needs to be my craft room too. But, my poor pineapple plants! I just know they're going to bloom this year if they survive. 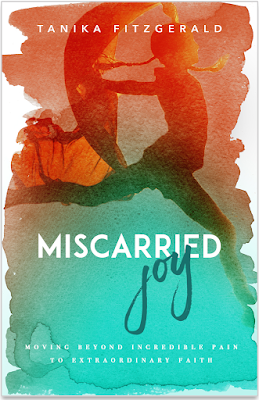 In Miscarried Joy (Nyree Press), Tanika transparently shares her deeply personal and disappointing experiences of losing her babies due to miscarriage. There were times when she felt God was the cause of her pain. However, her journey through the lives of Sarah, Rebekah, Rachel, Hannah, Elizabeth and Naomi, revealed quite the opposite - God had allowed her pain for a much greater purpose. Each of these women had something in common: they learned to surrender their will and trust God’s plan beyond the pain. They were pushed to a posture of prayer that led them from questioning God to have total confidence in Him. 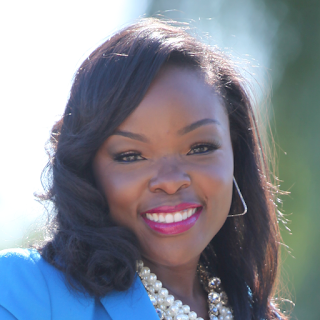 Tanika discovered that this season of waiting didn't show up simply to challenge her, but to change her. 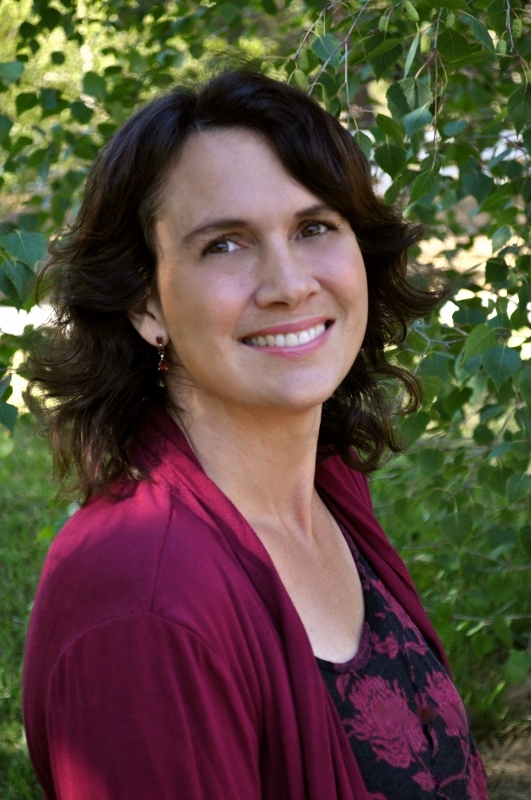 Q: Why do you think so many women suffer the pain of miscarriage and infertility in silence? How can the church foster an atmosphere in which these women feel safe to share their grief and find support? Pregnancy and miscarriage are both very personal experiences. When something you are expecting is all of a sudden not a reality anymore, it is not news we run to post on social media or shout to the world. Losing a baby is devastating. It has the potential to make a woman feel defeated, ashamed because is she is blaming herself and even jealous of other women. We have experienced the loss of a child without being able to mourn openly. The church does a great job celebrating the coming bundles of joy, but I believe a great opportunity presents itself for the church to minister to women who have experienced miscarriage or stillbirth or are having challenges conceiving. For some women, including me, the pain can be as severe as losing a loved one with whom you have spent a significant amount of time. The church can foster an atmosphere for women to share simply by creating opportunities to have the conversation. Every woman is not going to want to share, but she will listen to others encourage her through their experiences. I also believe churches should have ministries or small groups to cater to this need. When I had a miscarriage, I didn’t know where to go to just talk. If churches had groups or even events to help women to heal in this area, I think it would free so many women. Q: You believe God will give you biological children one day. However, what if the manifestation of His plan comes in the form of foster care, adoption or another non-traditional method of having children? I do believe God will give me the desires of my heart to have biological children. If I doubted in any way, then I would be exhibiting a lack of faith. I know God placed the desire to conceive and birth children in my heart, so I stand strong in faith, believing it will happen. There is absolutely nothing wrong with becoming a mom through non-traditional methods. My husband and I have discussed adopting a child after having our own. But for me, I still believe God will perform a physical miracle in my life. Q: Why does the absence of conflict and spiritual wrestling often result in weak and shallow faith? Shouldn’t it be the other way around? I believe faith is like a muscle. The more you use it, the stronger it becomes. The less you rely on it, the weaker it is when you need it. If you rarely encounter spiritual wrestling or conflict in your life, then you won’t have the opportunity to build resilience and elevate the level of your faith. Fighting this spiritual battle to have children is equipping me with the armor to be the victor in future battles God allows in my life. Q: Sometimes, as in the case with the thorn in Paul’s flesh, we ask God to change a painful situation and His answer is no. How can believers keep their faith strong in those situations? I believe the Word of God is the best place to go to keep your faith strong in these types of situations. John 1 says, “In the beginning was the Word, and the Word was with God, and the Word was God.” God is the ultimate Comforter and since He and His Word are one, the Bible is a good place to start. I would encourage people to find their situation in the Bible. Study it, pray and ask God to give you fresh revelation from the Word and how you can apply it to your life. No one would voluntarily go through suffering. Even Jesus said, “Father, if you are willing, take this cup from me; yet not my will, but yours be done." We have to remember we serve a strategic God who will not let us be pushed beyond what we can bear. The other thing I would tell people is to find others who are going through something similar. Suffering is always a bit easier when you have support. If you are a mommy-in-waiting, connect with other women who are currently in the same season or with women who went through it. Find people you trust to pray with you and who will allow you to vent when you need to. God did not build us to walk through this life alone. He gave us family and friends for a purpose. Lean on them when you need to. God may not immediately remove the thorn, but ask Him to make it tolerable. Q: Share with us how you were able eventually to view your sufferings as a gift rather than a curse. What really helped me is to think about the purpose of Jesus Christ. He went through the greatest suffering of all and though it wasn’t anywhere near pleasurable for Him, His pain served a purpose that benefited God’s children. The Bible tells us we will suffer for Christ. Every test has a testimony and when you share yours, it isn’t for you. It is to encourage and build the faith of those that hear it. It is how God uses you to build and equip His people. Being chosen as a vessel for the glory of God is a gift. When God instructed me to share my story with the world, it was then I knew this suffering was not just to build my faith, but to help women who are also in a season of waiting. To be used by God is a gift, and if that requires suffering, I will submit joyfully to His plan. Learn more about more about Miscarried Joy at www.miscarriedjoy.com, on Facebook (tanikafitzgerald) and via Twitter (TR_Fitzgerald). Every season I ask myself why I am going to blog about The Bachelor or The Bachelorette. The truth is, I just try to see how many people actually read my blog and get some new people taking a look. I just want attention. I do believe I entertain some people I'll never know about. A couple of weeks ago, the daughter of one of the elders from church was in town visiting family. I was at a restaurant eating with my parents when she stopped by to tell me how much she enjoyed reading my reality rants. It did make me feel good. So, get ready for next week when I start blogging about Nick Viall's season. This is going to be painful y'all. I can't stand Nick, even after he seemed a little more normal on Bachelor in Paradise. I predict it's going to be the most vile (pun can be intended) season yet because of how Nick has been in the past. I have never been a fan. I hope he finds someone so he will go away and we won't have to watch him anymore. I say that, but even then, there will be a wedding special and perhaps a "Happily Ever After" series. Speaking of which, I got caught up on Ben and Lauren's new show. She is horrible. I can't stand her, but I digress. Of course, after seeing the preview above, I'm already thinking they should have chosen women closer to his age. I think he's far from mature, but it wouldn't hurt to have some mature women on the show. At this point, does anyone care if I get back to the Gilmore Girls a Year in the Life recap? Things are sort of slowing down in my life right now, and I have lots of blogging days I need to fill coming up. (Even though I'm back date blogging right now). I've been contemplating whether it's too late or if anyone cares if I get back around to blogging my thoughts on Gilmore Girls: A Year in the Life. This week I've just wanted to read a book that I got for Christmas (which I hate, and Lori would definitely hate) and sleep. I'll need to take my Christmas tree down at some point. I do have a couple of special orders I still haven't gotten around to. I do need to do some bookkeeping tasks for the craft business. Now that I got distracted with YouTube videos when I should have been doing any number of things, I'm not so sure that I can out do this guy's spot on summary. Are you curious about my take? Let me know! Now that Christmas is officially behind us, the regular TV shows need to come back on. I am so over Hallmark Christmas movies that I'm sure will continue through the upcoming weekend. I'm watching because the options right now are so slim. They are all the same. Mom and I were discussing this. One third stars Candace Cameron Bure, one third Lacey Chabert, and the last third random female lead. Returning to small home town with high school crush. Leaving the big city and moving to a small town named something Christmassy (Winter, Hollyville, Chesnut...) and/or obsessed with Christmas. Twelve days of Christmas gifts (back to back viewed several days ago). Falling on their head and dreaming or magically granted a wish by Santa to live the life they would have had if they did or didn't marry someone and trying to figure out how to get back to their old life. I guess that means there are actually 12 combinations. Ironic. Merry Christmas Eve! We had our big day today. Here's a look! By the way, the hat was supposed to be mine, but was not what I was looking for. It looked far better on my brother has a pimp hat and became the joke of the day. The person most impressed with their present was Paige. I got her a phone projector she saw online. I read horrid reviews of how it was a piece of junk, but it made her happy, so that's all that counts. I now realize I didn't get Dad in a picture. So, I was talking on yesterday's post about my camera and it nudging me towards getting a new phone. Truth is... I really could use the upgrade. It's a minor inconvenience, but relative pain to have to charge my phone all the time and delete stuff on my phone on a regular basis because of internal memory. My phone came today and I started getting it set up. The thing about a new phone... it's part, oh goody it's going to do something different and it will be great and... part, oh my goodness I'm never going to get this thing set up right ever in my life. First time through, I didn't want it to copy 1700 contacts, but then it didn't transfer contacts at all. Ok. I'll reconnect with my old phone. Ok, I'll choose a swipe pattern to lock it though I don't really feel like I need to lock my screen. Ok. I hope I remember that pattern. Add in all my email addresses. Doesn't everyone have multiples? Ok, I think this is the right password for XYZ, nope, try this other one instead. I don't think I'm activated yet. I'll just deal with all this when I finish charging it. Leave the house for a while and come back later. Pick up the phone and try to get back in. Try 5 swipe patterns. "Try again in 30 seconds." Try 3 swipe patterns. "Try again in 60 seconds." Try 1. "Try again in 5 minutes." Then it was an hour. If I hadn't gotten it right then, I wasn't going to get it right, period. Ever. I went into my parents' office to the computer and logged onto AT&T to chat online with Jerome. Not his real name, I am sure. However, I will say the chat people have been very helpful this week because I have typed with three different people. He had to figure out how to manually factory reset my phone so that I could start over since we couldn't bypass the pattern screen. I did finally get back in my phone after the restart, but had to start from scratch with setting up everything again. Then, I had 1700+ contacts in my phone again and no way to weed out anyone I had ever followed on Twitter (not an exaggeration). I manually deleted out 1700 people from the address book. From experience, I know my car will never be able to make a phone call if I don't because it would never sync. I mean goodness knows I don't have Mark Cuban, Jonathan Lucroy, the cast of The Bachelorette or any other reality series' star's phone number. Those are just a few of the people I deleted out of my contacts. There was even some ferret. I have no idea where that came from. All this, and I still don't know if my new camera will sync up. I haven't gotten there yet. I almost just got locked out of Facebook and had to reset another password because I've had to change some lately and I can't remember what on earth I did this time. Let's just say all those memory games I've been playing on my Peak app sure don't seem to be doing any good! I also have to train myself that the recent and back buttons are on opposite sides from my old phone. I may have to go back to a flip phone. In today’s culture, waiting can seem like a constant nuisance. Whether it’s waiting in line, at the doctor’s office or in traffic, we are often presented with the struggle of not being in control of our own time. Likewise, believing God when a promise is new is easy, but it’s hard when the years pass and nothing changes. It’s harder still when desperation strikes, plans backfire and God does not seem to fill the emptiness. 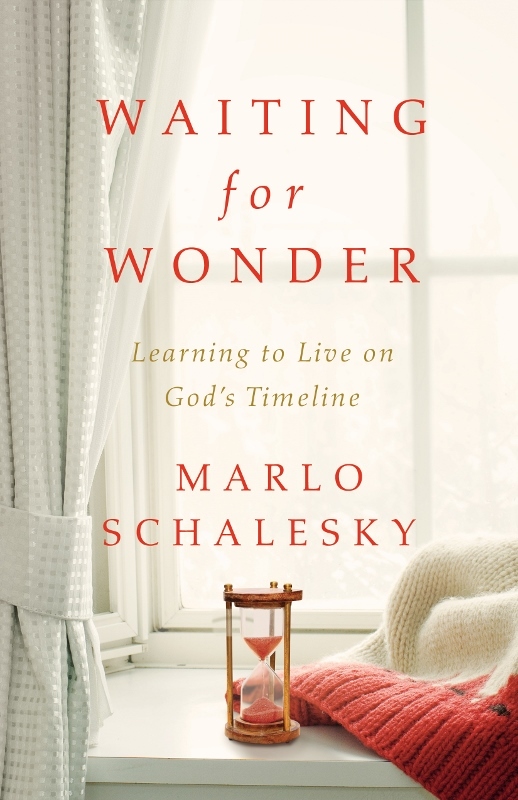 In Waiting for Wonder: Learning to Live on God’s Timeline (Abingdon Press), Marlo Schalesky encourages readers to think differently about our waiting periods of life. Do you remember when you were young and would climb trees and run through sprinklers? Do you remember when a simple daisy would capture your imagination and a butterfly would capture your heart? Those days when beauty was not so rare and life was painted with the vivid colors of awe? Too often we lose not only our childlike wonder of the world, but we also lose our wonder of God — that sense of awe, beauty, and catch-your-breath, more-than-I-ever-dreamed sense of who God is. We lose it in the waiting rooms of life. But what if God is more passionate, more wild, and more wondrous than we ever dared to believe Him to be? What if He is calling us deeper than our dreams? What if He’s calling us back to wonder? For me, writing about God’s wonder is about pulling back the curtain, just a bit, during the very hardest times of life, during those times when wonder seems the most impossible, so we might glimpse God as we’ve never seen Him before. In that glimpse, be captured by the wonder of this God who is more than we ever dreamed. I believe our only hope in hard times is found not in more instructions, more rules, more getting up enough faith, but it is found in encounters with a vivid God. It is found in wonder. Q: What compelled you to write a book on waiting for wonder? Because waiting is hard. Waiting well is harder, and God’s timing is so rarely our own. It’s easy to believe God and walk in faith when everything is going according to plan, but it’s hard when the years pass and nothing changes. It’s hard to keep praying, keep hoping, keep believing when you’re stuck in the waiting place and life isn’t turning out at all as you thought and hoped and prayed. In the long wait, it often becomes easier to listen to our fears than to hear the promises of God. Yet God still asks us to wait. I’m convinced it is precisely in the painful, awkward, awful waiting place that God is calling us to more. He is calling us, as He called Sarah, to wonder, to laughter in the face of the impossible, to a blessing that’s not just for us but for the whole world. This is a book is for people who want to find God in the waiting room, find Him where He seems most absent. It’s a book for people who hate waiting but want to find God in all His beauty and wonder even in the waiting place. Q: Why do you think we need to learn to wait at all? Isn’t it better to do something instead? God tells us to wait well, yet when we’re waiting for an opportunity, a change, a relationship to be restored, a diagnosis, a call, good news, bad news, I-don’t-know-what’s coming news, it is a tough thing to do that without squirming, complaining, trying to make something — anything — happen. But what about when we can’t do anything to bring about what we’re hoping for? That waiting place is a scary place. It’s a frustrating and hope-threatening place. If we can learn to wait well, we can, like Sarah, bless the whole world. That’s the promise: The world will be blessed through us, through the wait. Q: Can you tell us a little bit about your personal experience with waiting and why you wrote Waiting for Wonder? I wrote Waiting for Wonder because I’m bad at waiting, and I had to learn everything the hard way, from scratch. I often say I should have a PhD in the art of waiting because God has given me many long and arduous lessons in it. 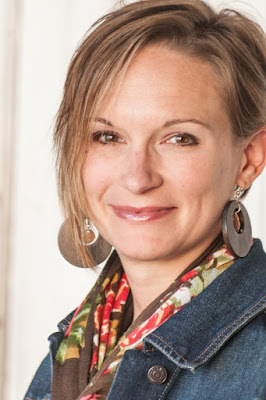 Much like Sarah, I too had a 20-year journey through infertility. 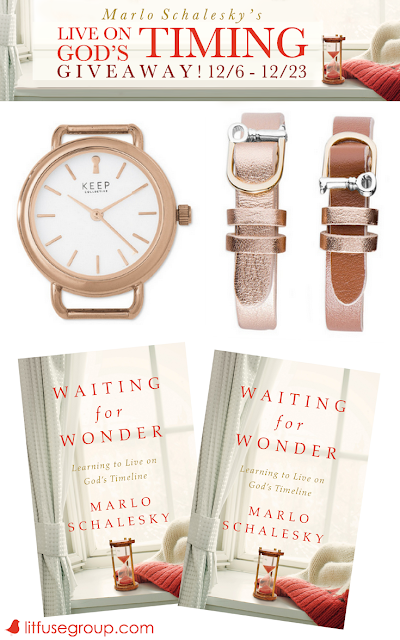 Even though Waiting for Wonder isn’t about infertility (I already wrote a book about infertility), that journey for me epitomized what it means to be stuck in a place where there’s nothing else you can do to “make it happen.” I tried everything, prayed everything, hoped everything and came to the place where there was simply nothing else to be done, prayed, hoped or said. I was not a pretty wait-er. There was a lot of kicking, screaming, complaining and crying. However, God changed me in the waiting place, much like he changed Sarah. He made me into someone new. The waiting place turned out to be a place where God was especially active. In it, I found a place of wonder. Now all I write about is the wonder of God. That’s why I want to invite others to walk with me and walk with Sarah on her journey through disappointment, doubt and detours. I want to share the God both she and I discovered in the “not yet” places of life. Q: You also say our world, our culture, doesn’t help us wait well. What do you mean? Our culture is about frantic doing, striving, trying to fix it and solving the problem now. Don’t wait; it’s all up to you RIGHT NOW. Not only are we not taught how to wait well, but we’re told waiting is inherently wrong. Action gets the job done. There are many instances in life when you have no choice but to wait. Contrary to our culture’s mantras, much of life is not in our control. We are not God, and life just doesn’t go according to plan. But as the world shouts that we can only make an impact if we “do do do,” God says to bless the world we need to learn to wait, to trust, to act in His timing (which, honestly, I usually find to be too slow!). So learning to wait well? Wow, how do you go about doing that? A text from a friend. An urgent phone call from a family member. An announcement at church. Maybe even a share on social media or story from the news. Many needs surrounding us require prayer. Each request is valuable and worthy of time before the Father, but the sheer number of them can be overwhelming. 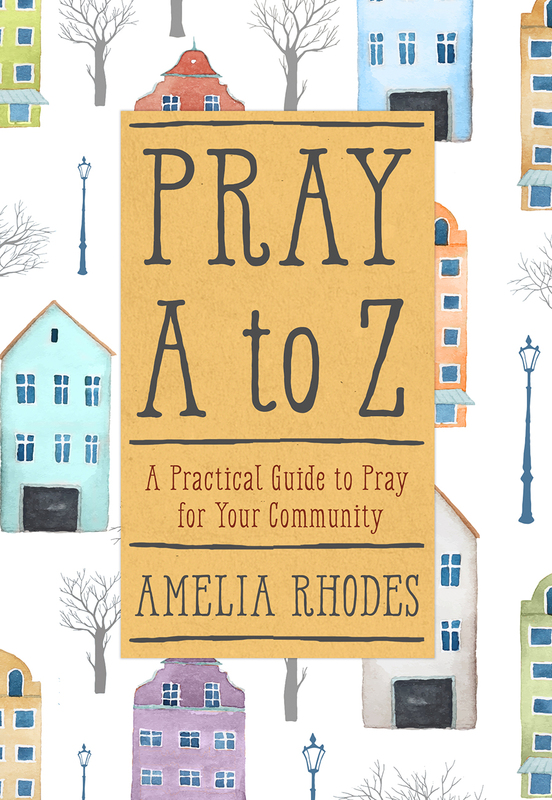 In Pray A to Z: A Practical Guide to Pray for Your Community (Worthy Inspired), author Amelia Rhodes helps readers topically organize their prayer requests and lay the burdens of their community at the feet of the Heavenly Father. Q: Pray A to Z is not an instruction book on the mechanics of prayer, but rather a guide to praying for one’s community, born from your personal experiences. Where did the idea of praying from A to Z come from? One day within the span of a few hours, I received phone calls and text messages from a number of friends who were all dealing with very heavy struggles. Each one asked me to pray for them. Of course, I said I would, but at that point I recognized how often I fail to follow through on praying long-term for people. As I prayed that day, I also asked God to help me with my prayer life. I realized how many people I knew were struggling with the same types of things — adoptions, cancer, marriages. 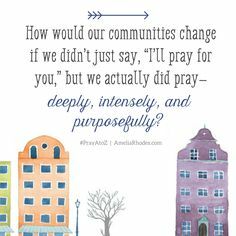 The idea of praying by topic seemed natural, and then I decided to see if I could make an A to Z list of all the needs and struggles facing our communities today. Q: You lead readers in praying through the alphabet for their community, but there are more than just 26 topics in this book. Share with us how the book is structured and how you have organized the individual letters. Each letter features prayers and prompts on five topics. Three topics for each letter focus on prayers of petition, and two focus on praise. So we pray about adoptions, abuse and alcoholism and then praise God for His abundance and that He is almighty. We pray for marriages, missionaries and ministers and those in the military while praising God for His majesty and mercy. Q: Why did you feel it important to include aspects of praise and adoration, rather than having only need-based topics? The needs get heavy and overwhelming. I found that incorporating praise brings the focus back to our great God. Praising Him helps us recognize how every need we have is met in who God is. Q: What are some of the prayer needs you cover in the book? I covered the needs of families in our communities, such as foster families, special needs families, pregnancy crises, raising children, marriages, divorce, adoption and infertility. I also take a look at many of the justice issues facing our societies today, including prejudice, homelessness, hunger, human trafficking, refugees and violence. The prayers also include topics related to how we interact with our communities, including generosity, kindness, estranged relationships, joy, obedience to God, vanity and our yearnings. My hope is readers will not just become more engaged and excited about their prayer life and their relationship with God, but as a result they will also become more involved with the people who surround them every day. I’ve had readers tell me how God has made them more aware of the struggles people are facing and has also revealed how they can be His hands and feet of love to their communities. 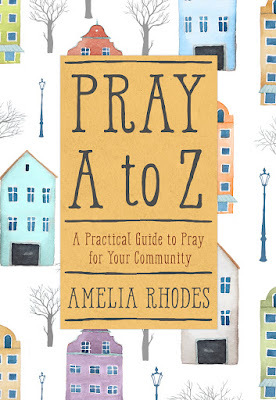 Q: Do you have any additional or supplemental resources to help readers pray A to Z? I developed a set of prayer cards featuring just one topic per letter but covering many of the major issues in our communities. I’ve also created a guide for groups that is available for download for anyone who desires to begin a prayer group in his or her neighborhood, church or community. It happens often. One person finds something on Facebook or Pinterest and tags me. Then the same day, I'll get tagged 2 or 3 more times. This time, it's the messy bun hats. 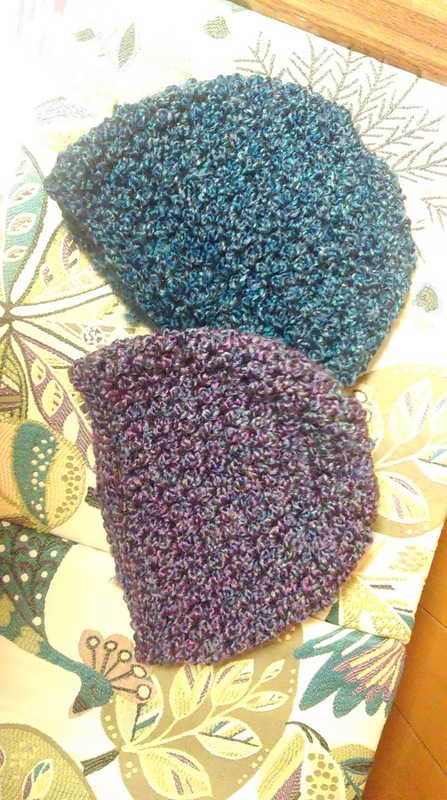 The knitted or crocheted hats with a hole in the top for a pony tail or messy bun. Of course, I get tagged or asked in person about them multiple times, and only have one person seriously commit. My name is getting passed around too. They are what I've been working on the past few nights. If you want one, let me know! I have a couple unspoken for made up. The picture of my hair coming out and about is not that great. It was the night I was feeling really bad and just gathered it up without a brush or hair band. Once upon a Wednesday night, there were only two kids in class. Grayson still refuses to be seen on camera, so you have his voice along with the lovely Erika. Warning: This is another one of those pointless, boring blog posts. I've officially gotten my Christmas cold. I rarely get sick, but when I do, it's when I come home from vacation to a heavily wooded area (the last time I went to Tennessee and spent time around the forest or to Seattle/Vancouver and was up in the trees there) or in December. As a kid, I remember Mom always saying, "It's almost Christmas. You can't get sick." Fifteen years ago when I taught school that one ill-fated December, I had strep to finish off the semester. Last year, I got it about a week earlier. At our last craft show of the season, I was so sick I couldn't talk. I remember this well, and was just waiting on it. This is the conversation I had with my mom yesterday. "I wonder why you got a cold." "Why does anyone get a cold?" "Mom, I'm 40 years old. Of all those years, how many times have I gotten sick in December?" At least in my state of not being able to breathe properly I've checked a few things off my list. I've been working on hats and finally got my stack of Christmas presents wrapped. I waited until I had everything. 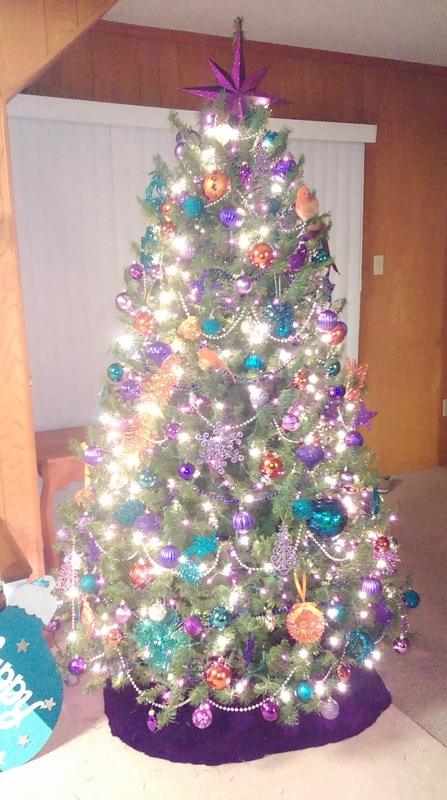 Here's my obligatory picture of my tree this year with the stack of presents next to it. I didn't put them under the tree because there wasn't room for the biggest one and why dig them all back out when you can just pile them? 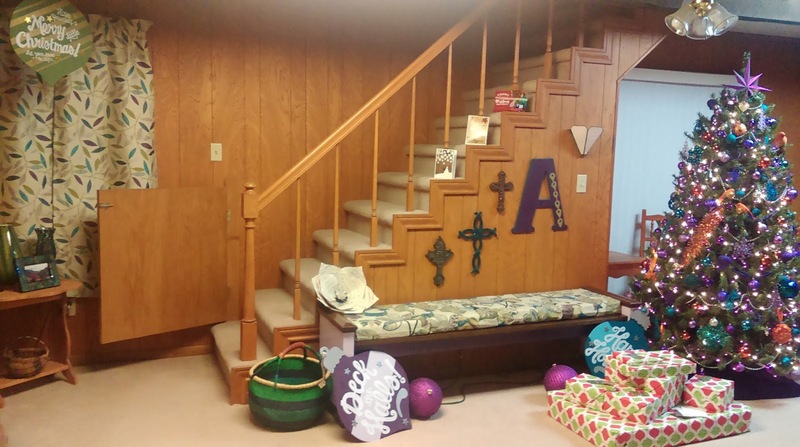 The last few years, I have been decorating the banister and hanging lights from the rafters. 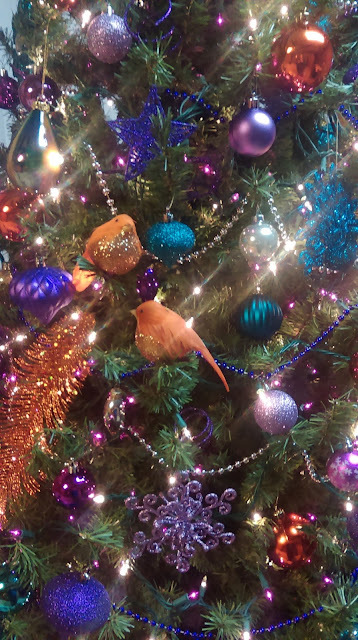 I've decorated three trees in the past. This year, I didn't even get out any of my Wizard of Oz ones for the tree. I just went with my tree full of mostly Walmart ornaments. I decorated A tree and pulled out three of my large wood balls I made. There's also a hat box with Santa on it that holds the garland I had been putting along the stairs. I don't have pictures right now of the final stockings, but all three are finished with more than a week to spare. That's like super early for me when it comes to crocheting something for Christmas. I'm usually trying to finish something up to the last minute, hoping people aren't pulling up in the driveway yet. 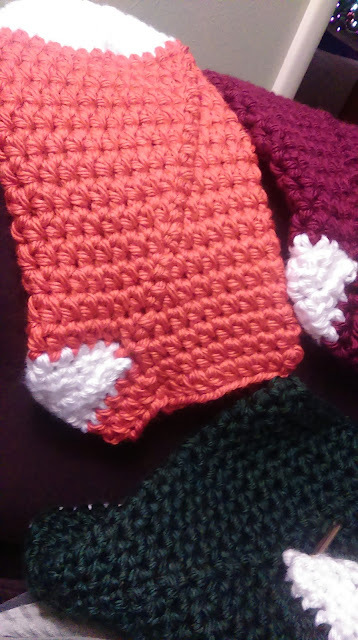 Mom asked for the stocking holders that we usually take around for our booth back so she could hang stockings. The thing is, the stockings are really big, and they stretch once she starts filling them, the holders won't hold them. I'm not sure the new family members will know what to think. Speaking of which, I did have to look up the correct spellings like a social media stalker of my brother's stepkids. When Dad picked the stockings, I had to warn him that I knew I was right on the name tags I attached because he was going to think I was wrong. Turns out, presents under the tree are just going to be spelled wrong. Whoops. At least it is pronounced the same either way. It's not like when I get to my Grandmother's house and have something with my name spelled correctly only to be called Ordra. Come to think of it, I'm not so sure my other grandmother didn't spell my name wrong from time to time growing up -- on my annual pair of Christmas socks. If mom goes back to Christmas tradition which she sometimes does, there may be socks in the stockings. One year she went with traditions from both sides of the family and we got socks, Hershey bars and something else. Between my socks coming apart (with black fuzz all over my bedroom carpet to prove it) and Peyton raiding my sock drawer, I'd take socks. Warm, fuzzy ones. It's been cold. I can't believe I just went on such a random trail about socks. I'm telling you, this is what my life has come to. It's all I have to talk about. I don't know what I'm going to do the next few weeks between book releases. I have some blank spots on my calendar. If you are still reading regularly, you'll be thankful to have Nick The Bachelor. According to the March of Dimes, somewhere between 15-25% of known pregnancies end in miscarriage. Despite the fact so many women share a common loss, they endure the grief of miscarriage alone and in silence. Many feel a sense of guilt or shame, as though what happened was somehow their fault. Others simply don’t want to burden others with their pain. No matter the reason, the dark season following the loss of a baby can shake the faith of even the most faithful believer. In Miscarried Joy: Moving Beyond Incredible Pain to Extraordinary Faith (Nyree Press), Tanika Fitzgerald offers hope for those dealing with incredible pain of loss, providing help to conquer discouragement and discover new purpose. Q: We don’t often see the words miscarried and joy together in the same sentence. How and why were you able to marry them as the title of this book? When a woman is pregnant, she is often referred to as someone who is carrying a bundle of joy. When she miscarries, I believe that bundle of joy goes to be with Jesus Christ in heaven. When I was writing the book, the phrase “miscarried joy” came to me as something I had just lost — a miscarried bundle of joy. When we miscarry, it is a devastating event in our lives. Our happiness fades, but our joy can be everlasting if we choose. So although I have lost three babies due to miscarriage, I am still able to reflect on the joy I had in those moments of expecting and the joy I still have as I wait for God to work another physical miracle in my life. Q: What was the turning point for your faith amidst the pain of three miscarriages in a short period of time? Was there a Bible verse that opened your eyes to see your relationship with God differently? The turning point for me happened when I began to dive into the Word concerning my situation. I looked up scriptures related to miscarriage, and I studied the lives of Sarah, Rebekah, Elizabeth, Rachel and Hannah. What I noticed is God allowed the waiting season in their lives for a specific purpose. I also realized in each of their situations, God’s timing was absolutely perfect. Had Elizabeth had John the Baptist any earlier than God planned, he would not have been born at the set time to fulfill his purpose of leading the way for Jesus Christ. This scripture helped me see the heart of God in the midst of my pain. If these miscarriages did not come from Him, then it had to be Satan attempting to destroy my faith and trust in God. That was when I decided to stand strong in what I believe God to do and to trust fully in His plan. This scripture helped me still see God as a loving Father. He was allowing this pain to develop and prove the genuineness of my faith. Q: In the book, you talk about a purpose for losing your babies. What do you think that purpose is? It is not a purpose for losing my babies but rather a purpose for experiencing the pain. Think about Jesus Christ and His death of the cross. Without a death, there would not have been a resurrection and none of us would have the privilege of receiving the free gift of salvation. It is the same with us. Every pain God allows into our lives is for a purpose. For me, I think the purpose of this pain was for me to develop a more personal and imitate understanding of who God is in my life and what He is able to do. Throughout this season of waiting to become a mom, I have truly experienced God as my comforter, the lover of my soul and my provider. Having knowledge of God is very different than actually experiencing Him in your life. This pain has taught me to trust and believe in Him completely in ways I never have before. Many things have come easy in my life, but becoming a mom is something I am going to have to fight for spiritually to conceive and birth naturally. If I am able to take my prayer life to the next level here, then surely I will be able to extend that to other areas in my life. So this pain has definitely caused me to grow and mature spiritually. Q: How does the message of Miscarried Joy move beyond the loss of a pregnancy and offer application for all areas of life for men and women? Every single person has to wait for something at some point in his or her life. It could be a baby, a spouse, an open door of opportunity, healing or a variety of other things. Regardless of what a person is waiting for, it becomes frustrating! Miscarried Joy touches on principles of faith that can be applied in every area of our lives. Faith is all about trusting God’s plan and timing above our own. It is not how long we wait that matters, but rather what we do while we are waiting. We can build our character or destroy our confidence in Christ. My book will equip all readers to push aside the disappointment and implement these faith principles in their lives — not just for the blessing, but because we want to deepen our relationship with Jesus Christ. I talk about facing and overcoming discouragement as the first step to move beyond the pain and begin walking in extraordinary faith. The book also talks about the power of prayer, contentment and the dangers of doubting God. These are all things that can help men and women expect a move of God in their lives. Q: You say our thoughts and words are powerful, particularly in times of crisis. What role does Scripture play during the difficult times of waiting, and how can we make sure our thoughts are aligned with God and His word? A very crucial one. When you are in the midst of a waiting season, Scripture has the power to inspire, edify, equip and encourage you through the tough seasons of life. It will remind you of God’s care and concern for you through a display of how He’s worked in the lives of others. It is so important to focus on what you believe your outcome to be; confess that in your prayers and think about what you believe God will do. To confess His Word, we must know it. So in the difficult times, Scripture is where we should go when we are feeling discouraged and depressed. If you don’t know where to go, start with the Book of Psalms. The Holy Spirit will lead and guide you from there. We must increase our knowledge of the Word so we can continue to confess His Word. Preventing our natural mind from wondering about the “what ifs” is difficult, but if we keep our mind focused on what God says about our situation — regardless of how the circumstances look — we will be able to align our thoughts with His Word. 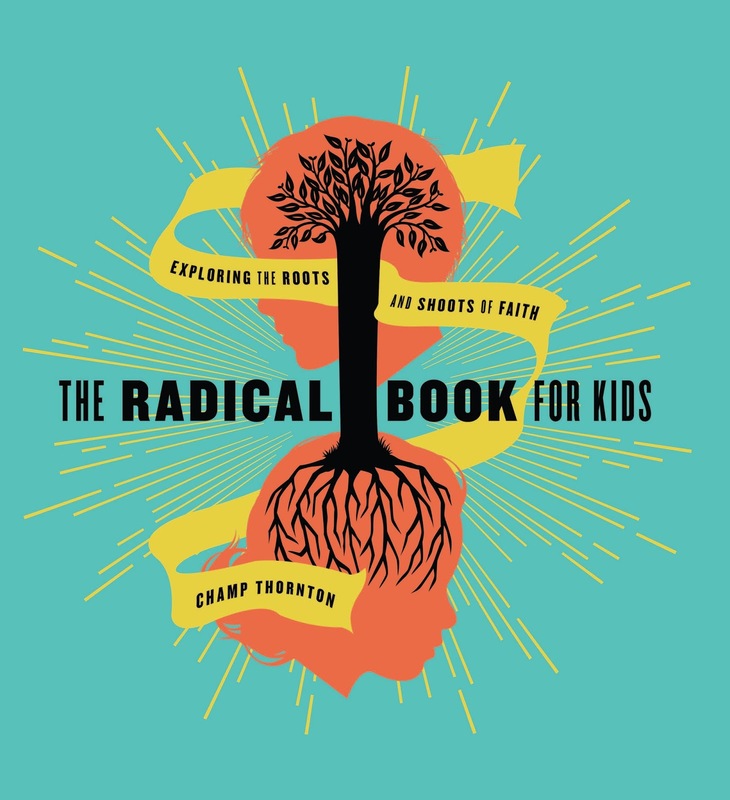 The Radical Book for Kids by Champ Thornton is a fun-filled explorer’s guide to the Bible, church history and life for boys and girls ages 8 and up. Along with examining some of the most exciting realities in the universe, the handbook is vibrantly illustrated and chock-full of fun facts and ideas. Deep truths are communicated to elementary and middle-school aged kids while stimulating their curiosity and sense of adventure within a gospel-centered framework. 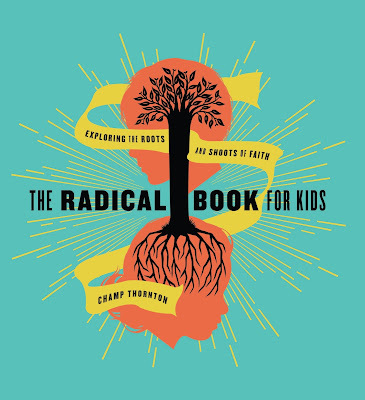 Q: How is The Radical Book for Kids designed to be used? Can kids go through the book on their own, or is it best for parents and children to read it together? This is a book kids, ages 8 and up, can read on their own. For curious readers, a table of contents and index make topics easy to find. So kids can explore their book however they like: hopscotching around via topic or just reading straight through. For kids of younger ages, parents can also read this book aloud in family devotions. Bible teachers can use it to supplement their main curriculum. For parents or teachers, there are plenty of places to stop reading and to discuss issues posed, consider questions asked or just laugh at something funny. As the book has been previewed, I’ve learned adults have found this book useful for themselves or to give to others who are growing in their faith. Q: Do kids need to have some kind of church background to get the most out of the book, or can it serve as an introduction to the Bible and Jesus? This book assumes no prior knowledge of Scripture or Christianity. Terms and concepts are explained along the way. The format of the book also doles out truth in digestible portions. First, the chapters are generally pretty short; some are only two pages long. No reader should get bogged down. Second, the book unfolds in a sequence that aids comprehension and application of the Bible. The Radical Book for Kids starts with a summary of the Bible, then an overview of its various parts. Only then is there a discussion about how someone could read the Bible personally each day. From there the book periodically presents a chapter about how to read certain portions or genres of God’s Word: law comes first, then stories, then poetry and wisdom, then prophets, gospels and finally, toward the end of the book, the New Testament letters. In this way, learning is progressive. However, some content goes way beyond the basic knowledge of the Bible as well. Ideally, the book could serve a wide variety of readers — both those who are familiar with God’s Word and also those who aren’t. Q: The book is a vibrantly illustrated book, full of charts and visual aids. Can you describe more about the format? This book presents 67 short chapters containing a wide range of topics presented in a variety of creative ways. There’s nothing boring about God — He’s the most engaging, creative, vivid and energizing Being in the universe. In fact, just look at the universe He’s created! A riot of colors, sounds and smells, tastes and textures. This is beauty, but His truth is just the other side of the same coin. God’s beauty, truth and goodness are all different expressions of the same reality — God’s reality. So, He’s the farthest thing from boring, and when we teach about Him in a way that’s uninteresting, we misrepresent Him. We wanted this book to engage minds with truth, ignite hearts with His goodness and captivate imaginations with His beauty. And Scot McDonald’s creative design work has brought all the wonder-filled fun-factor I had hoped for when writing the book. Vivid colors, eye-catching pictures, hand-drawn sketches and illuminating sidebars fill its pages. Q: What was the most difficult theological topic to explain, and how did you break it down in a way kids can understand? Will parents learn anything by reading along with their children? There are a number of higher-level theological truths presented in The Radical Book for Kids. Although it may not be the most difficult of all topics to explain, there’s more to one of the most familiar passages in the entire Bible than meets the eye. To help understand how the whole prayer hangs together, I compared the Lord’s Prayer to a letter (or email) that a kid might write home from camp. First, there’s a longing for things to be set right — to be at home finally where, in the prayer, God’s name is treasured, His kingdom has come and His will is being done. Until that happens, many requests are asked of the Father (to provide, forgive and guard from evil), just like a kid might write home asking his parents for things. I tried to include topics that are sometimes complex because I want all readers of all ages, including parents, to find this book a helpful and enjoyable learning experience. Q: How can parents take a more active role in their children’s spiritual growth? The active role parents can take in the spiritual life and development of their children operates in the context of relationships. If spiritual growth is the “traffic,” then those vehicles travel best on wide, well-maintained highways of relationships. In addition to these kinds of discussions, it’s hard to overstate the importance of prayer for parents actively encouraging their children’s spiritual growth. Although God uses human means (conversations and prayers), the only one who can ultimately change your children’s hearts (and that is what we’re aiming for as parents) is God Himself. So we must always bring our children’s spiritual growth before the Lord, asking Him to work the grace and love of the gospel of Christ into our children’s hearts. Q: Do you have any advice for parents who want to make spiritual development part of their family culture but are struggling to know where to start? Here are four ideas. First, for parents who’ve not been making this kind of development the priority they’d like, I’d recommend that parents openly talk to their children, sharing in humility where they’ve fallen short in this area and what they hope to change in the future. Repentance before God and even before our families is a good place to start — and to continue. Second, I’d keep expectations fairly low. Instead of planning to have family devotions seven days a week, it might be better and more realistic to aim initially for two-to-three days per week. Even then, that family time in the Word and prayer might only last five minutes (perhaps even less for younger children). Fourth, you may want to start by reading and memorizing one of the Psalms together. My wife and I read this advice years ago and have found it very helpful in our own family. Even very little children can participate, reciting together a verse (or verses) from the Psalms, as a parent reads out loud. The verse may be read several times during each family devotion time, and a new verse could be added every few days as previous verses become more and more familiar. In this way, throughout several weeks, you might be surprised to discover how quickly your family could memorize an entire Psalm. Favorite psalms for our family have included Psalm 1, 23, 100 and 103.